Affordable Accoutrements: Celebrating Centerpieces 2: The Journey Continues! Celebrating Centerpieces 2: The Journey Continues! 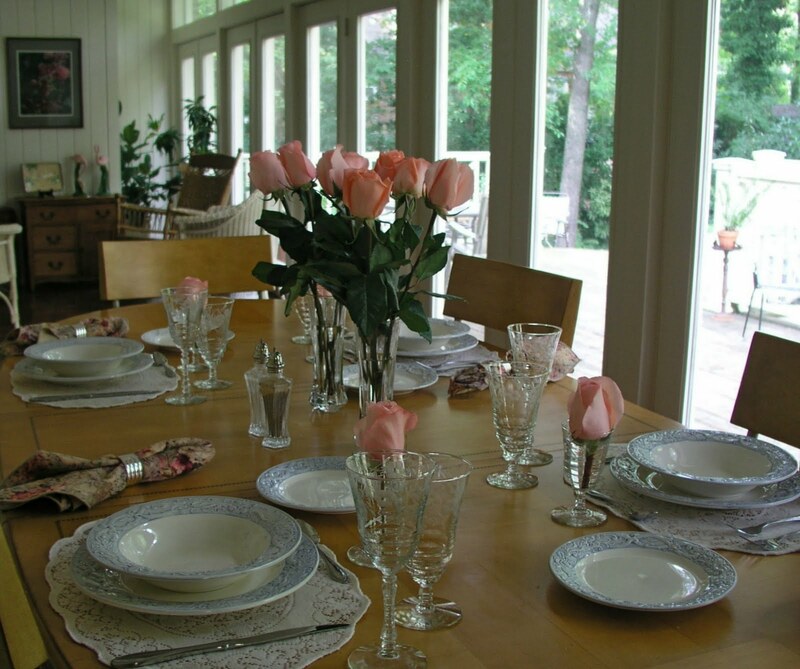 In Celebrating Centerpieces (HERE) I took a look back at the first 50 tables I set for Affordable Accoutrements. Perhaps it's time for an update. I think a centerpiece provides the heart and soul of an eye-pleasing table setting. Naturally it's only one element of an overall design, but decorating the center of the table can require as much energy, imagination, and creativity as the rest of the table combined. Flowers and candles are traditional favorites, but centerpieces can be as simple as a bowl of fruit, a plant, or a piece of three-dimensional artwork. Below you'll see examples of tables I've set for you during the past year. Some were used for 'real life' dinner parties. Others represent pure fantasy. 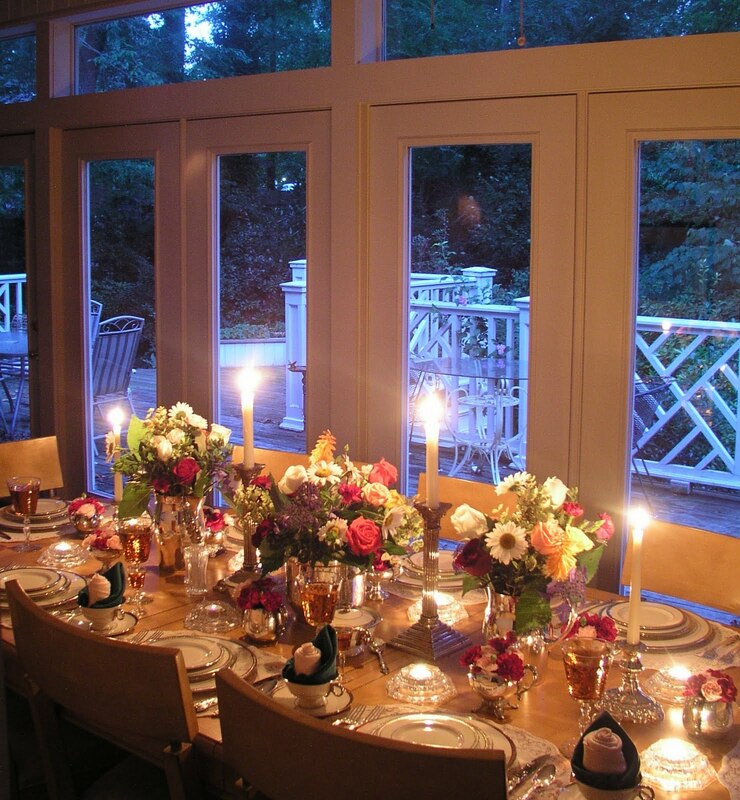 Here's a hint: if the flower arrangements are at eye level and the 'glow' of candlelight borders on bonfire intensity, it's probably not a place where guests enjoyed an evening meal! If any of the tables below pique your interest, you can click the titles and see the original posts. I hope you enjoy Celebrating Centerpieces 2! Tablescape with Velvet and Lace The "velvet" was widewale corduroy fabric. 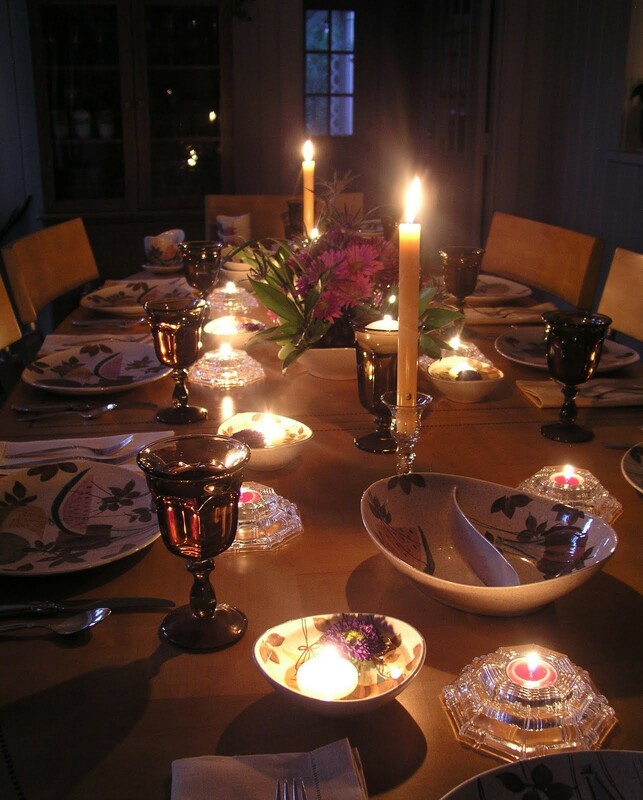 The table for four was set the same evening for an impromptu dinner party. Unparalleled Versatility of Whiteness One large set of white thrifted dishes = two very different tables. I'd welcome your feedback. If you were coming to dinner, and the tables above were set -- all of them at once (impossible of course), which would you choose? If you have a least favorite, I'd be interested to know that as well (be gentle!). I'll do my best to respond to every comment. If you don't have a blog, please send your e-mail address to affordableaccoutrements@gmail.com, and I'll be in touch as soon as I can. Thank you for stopping by. I hope you enjoyed your visit. Please join Susan of Between Naps on the Porch for Tablescape Thursdays! What a truly inspirational post and one to which we are certain to return to glean and garnish ideas. But to choose one table setting centrepiece? An impossibility. You have such a very good eye for colour, texture and design and in each there is so much in the way of detail to be spied. Thank you so much for going to all the time and trouble which we know it takes to share these with us. Fantastic Dear !!! Your arrangement is Excellent !!! I am new follower .. Spare few minutes to visit my Blog and Say a Hai !! the table is really your stage and the dishes and equipment are the actors. It is like a nutcracker suite but the dancers are flowers, cutlery and dishes. You create not only great center pieces. You create the perfect harmony between all ingredients. And I love your outstanding tableclothes. That makes your tables very special beside the wonderful china, silver and crystal. Thanks for your inspiring photos. I enjoyed every picture as a memory to a great tablescape. I really love them all but the Glads really showed out to me. What a treat to see all these beautiful tables in one post!! I must say it is very difficult to pick a favorite because they are all just spectacular. I think, though, my favorite is the all white one with the dogwood centerpiece. I don't remember seeing that one. Gorgeous. Bill, you are a master at this and so inspiring for the rest of us. I know your guests must feel so special. Enjoyed seeing these beautiful table settings again - there were some I did not remember. Would not even attempt to pick a favorite. just beautiful....you have quite a wonderful eye for tablescapes.. I really enjoyed looking at all of them..what an inspiration..
What always catches my eye in your tablescapes are the floral arrangements.....I always oooh and aaah over them. I can close my eyes and smell their sweet aroma! Love the informal arrangement in Unparalleled Versatility of Whitemess...Love how it just flows in every direction! Love the meaning, the sparkle and fluff of In Respectful Memorium! I am always in amazement with the use of lighting and reflection that you seem to capture! So jealous! Since you did ask....my least fav was If Dinnerware could Dance! Thanks for the walk down memory lane! OK...I first must compose myself, mop up the leak on the floor, and stop laughing at the "[bordering] on bonfire intensity" remark!!! Ahem! OK...now I am ready to make straightforward, unemcumbered,....wait...I'm not done laughing...........................Oops! Another little leak!...............OK, this time I swear I'm ready. Tres magnifique!! !Each and every photo is stunning, and I think you already know I would want to be invited to every single one! (Aren't you relieved we don't live near each other? I'd be inviting myself over all the time!) If you're just going to stick a .45 to my temple over the matter, though, I think I'd choose Unparalleled Versatility of Whiteness....or Listen My Children...or Glads Make Me Happy. Hell, I don't know! It's like choosing your favorite child. (Although the parents actually DO choose a favorite right in front of the kids on that cable TV commercial. Hilarious!!!) You should have done this as a party, man, so we could all join in the fun with you!!! At any rate, you know you're rockin' it, Bill! And for the record, I totally agree with you: The centerpiece can so often make or break the tablescape. That's how we can get away with using the same dishes and flatware and stemware over and over again...it's all about the centerpiece! That's what I preach to the new bloggers who are worried they don't have "enough" dishes to showcase. It's about how creatively one displays his/her wares, not how much is in his/her coffers. Later, buddy! Your tablescaping book should be named: "THE ART OF TABLESCAPING by BILL"........or, "CENTERPIECES AND TABLESCAPINGS by BILL" What do you think?! Really?....We have to choose....one?.....just one? Now they're all just drop dead gorgeous....but.....if you MAKE me choose....I love the dogwood branches. Virginia's state flower and the flowering tree that seems to assure me that Winter is over. But....that's not to say I don't adore every other centerpiece you've posted before us....how about you....Which one is YOUR favorite? Bill I view you as an artist and this is your pallete. Your centerpieces are always created with great color and shape. Your ability to mix textures and to create new ways of displaying the arrangements are an inspiration. One of my favs was the "Listen My Children" with the Revere Bowls. Ultimately though, the "Mikasa for Me" strikes the bell the most because of the romantic look you created with the table linens. The use of silver, crystal, and a classic china pattern made for the perfect elements. Adding in your beautiful floral arrangements finished this romantic table with the perfect touch! I enjoy all of your tablescapes and your centerpieces are always something to look forward to. You have a great body of work here and it's all commendable. Being a Southern girl, I think my favorite is the Queen Anne's Lace centerpiece! Simple, but unique! I still think you should publish a book! Impossible to pick a favorite, it's like asking a mother to pick her favorite child. 'Love them ALL! But the standouts for me were Respectful Memoriam (for all the reasons I stated on that post), and I'm partial to Hydrangeas so of course I loved that 'Unvalentine's Table w/ Roses & Hydrangeas', I loved the coordination of the roses, the rose wine, and the fruit cups, so pretty. I also loved 'Whiteness' and 'Simply Vintage', and another standout was 'Velvet & Lace', so rich, and I loved the way the lace pooled on the floor. Oh, heck, it's all perfection! I cannot imagine how long it must have taken you to download all those pictures for this post. It is very hard to pick a favorite b/c I have favorite elements in all of them, although, the 9/11 tablescape was one of my most favorites. Love all the fresh flowers, especially the one w/ what I would call Queen Anne's Lace. The dishes are always gorgeous (really like the Mikasa floral plates, forgot the name) and the traditional dining room chairs. The rose? picture over the fireplace was stunning by candlelight, as well. Love all the windows and the view you have when you dine also, and how you mixed up the chairs in different tables. Probably forgot a thing or two, but just my take. Keep doing what you're doing! Thank you for the trip down memory lane Mr. Bill. The one that caught my eye today was Carnivale - so vibrant - but if I were ever truly your guest (and I can only dream) - I would love to be a guest at your Informal Formality - by candlelight, of course! I dont one to pick one table I want to pick all of them. All the tables are just amazingly beautiful. This wasn't easy as I love them all! If I had to pick, and apparently I must, then I have to go with velvet and lace. So elegant! I think I better up my flower budget because you have set the bar unimaginagly high! This was so entertaining seeing them all together. I thoroughly enjoyed seeing them! Thanks! I am new at this, and so appreciate that you put your gorgeous centerpieces all in one place! My favorite, without a doubt, is the classic white dishes with the dogwood centerpiece. It takes my breath away! Bill, I just lost my comment to you. Not sure what happened. Let's see if I can say it again. LOL! I so enjoyed seeing this post, and I'm hard pressed to pick a favorite 'scape because they are all wonderful. Seeing one of your tablescapes is like reading a beloved book, and I look forward to each new chapter just as I love to look back over them all. You do this with such panache, and you deserve three cheers. Here are mine: Bravo! Bravo! Bravo! Wow ..that is a dream post...every table is perfection!! Each and every one is gorgeous, unique and inspiring!! Bill, what a wonderful feast of eye candy! Each table is beautiful and I can honestly say there is not one that I don't like. However, your velvet and lace table setting was the very first of your blog posts that I read. It was then, and remains to this day, my absolute favorite of all the tables you've set. To say it's gorgeous would be an understatement. Bill,I can't choose my favorite. Each is gorgeous, in it's own way, and perfect for the table setting. You definitely have the eye of an artist and plant lover. Just out of curiosity, Bill, do you have a favorite? You are so creative!! Congrats my very talent friend! Bill, I've just come across your blog and what a sight to see..absolutely breathtaking tablescapes, each and every one! It would be hard to choose my favorite. They are all so unique and elegant. Do you have a book out on Tablescapes? If not, you should and I bet you could get all the fine china and crystal companies to fund it. Thanks for sharing all of these with us. I'm bookmarking your blogspot. I used to belong to a Dinner Party group but I'd say only one lady in the group would set her table like this! Hi, Bill! I've been hoping to see a post of yours and here you are--another magnificent one. I can't choose...that's all there is to it. I would just be soooooo happy to be there that any one of these beautiful tables would suit me just fine. I will tell you that I gasped a little when I saw the daytime picture with the dogwood centerpiece - WOW. I didn't want to read the other comments because I didn't want to be swayed, only to find that many others couldn't choose either. And as always, I, like Alycia, found your sense of humor ("bonfire intesity"). It's too bad we can't all meet--at your gorgeous house, of course! :) Thanks, Bill! Hi Bill, I think I'd choose "real tables" and I think it's because of the pink/peachy roses. As much as I am drawn to dishes, I think the centerpiece pulls me in the most, and I prefer a simpler one such as these roses. And even though these are not low, I prefer not a very high centerpiece so you can see the person across the table from you. Just being practical. I enjoy all your table settings and constantly wonder where you store all those dishes! Maybe you do a table scape and then sell them! As above, my first choice was the Queen Anne's Lace. While browsing thru again, I fell in love with the swans filled with the fluffy white boas! They are all so gorgeous, hard to decide! Good hearing from you! Have missed you! really great work! I still love the carnivale one! Stunning ~ all of it! They are all Gorgeous as always !! You have a eye for Beauty and your tablescapes all show this. I don't know how I missed this post. So glad I looked it up! As I was scrolling down the pictures I kept ooohing and aaaahing. Everyone of them were my favorite. But I guess the one that I had to go back to was the Carnivale one. So dramatic! What I would give to be a guest at one of your dinner parties. I bet they are so much fun and the food and drink delicious! I can see that they are beautiful! Take care! You'e done so many beautiful tables. Each with such attention to detail. It's impossible to choose! I just found your Blog through a referral, and I really enjoyed viewing your beautiful photos! Some of the vintage dishes took me back. Would you do a Tropical setting? I am in Florida now in my retirement house and after our remodel I will get back into Tablescaping. LOVE your Blog! Great table-scapes. There is no better way to upgrade an elegant dining experience than to set a beautiful table. I recently posted on my blog about silver at the table. I'm linking to your post so my readers can enjoy your beautiful tables too! Thanks. You are the avowed Tablescape King!